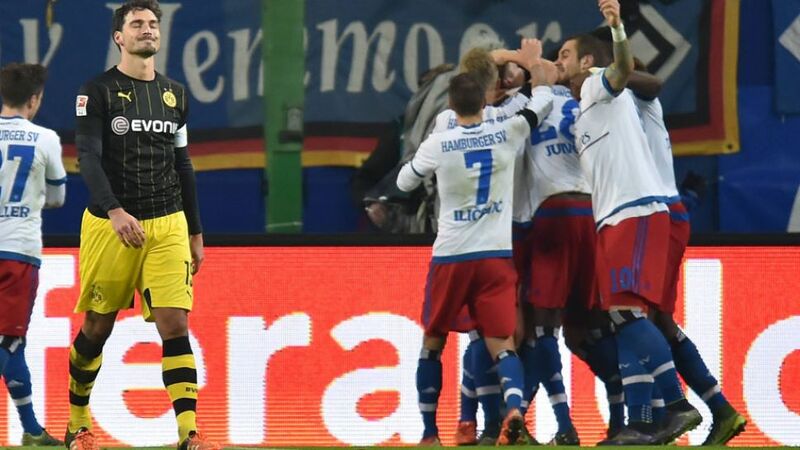 Borussia Dortmund slipped to a second league defeat in 2015/16 after a below-par performance in a 3-1 reverse away to Hamburger SV in the Matchday 13 opener on Friday evening. The match began at a furious pace, with the hosts seemingly determined to show they could match their more fancied guests on an equal footing. They hounded Dortmund tirelessly and although Ivo Ilicevic missed an early opportunity to put Hamburg in front, he later won the penalty from which Pierre-Michel Lasogga hammered in the game’s opening goal.Dortmund coach Thomas Tuchel was an animated figure on the touchline as he tried to cajole his charges into playing with greater cohesion, but it was HSV who scored again. Nicolai Müller was allowed to run unchallenged through midfield before laying off to Lewis Holtby, who stroked in from ten yards out. Matters went from bad to worse for Dortmund after the break when captain Mats Hummels turned the ball into his own net from a corner. Pierre-Emerick Aubameyang scored a late consolation for BVB with a well-taken finish, but it was too late for the guests to muster a comeback. It was an outstanding team performance from Hamburg, but Holtby nevertheless stood out in midfield. He appeared to be everywhere on the pitch, covering over 11 kilometres as well as scoring the crucial second goal to give his side a well-deserved cushion. Hamburg went into the game with the second-worst goal tally in the league, having scored just 11 in their first 12 Bundesliga matches of the season. Here they were disciplined, energetic and thoroughly deserved the win in an encounter they netted over 20 per cent of their total goal haul so far. Lasogga put his side 1-0 up for the fourth time this season. No other player has done so more frequently.Hummels’ own goal was the second in his Bundesliga career. His first was exactly five years earlier on 20 November 2010 against Freiburg.Aubameyang has now scored 15 league goals in 2015/16. No Dortmund player has ever scored as many at this stage of a season.